Many airports with regularly scheduled international service have the word "International" in their official names, but others, including such major airports as London Heathrow Airport, do not. Conversely, some airports which call themselves international airports, especially in smaller United States cities, in fact have no scheduled international airline passenger service but do have customs and immigration facilities serving charter, cargo and general aviation flights. 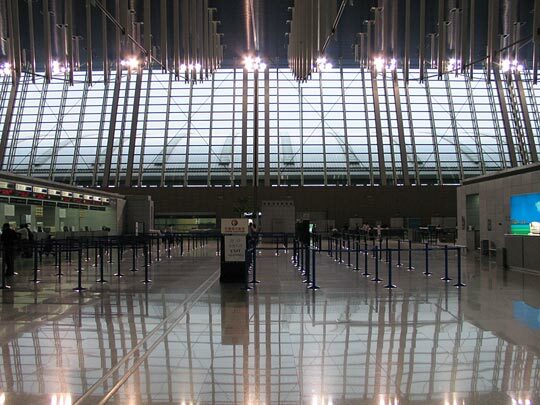 At many of these airports customs and immigration services are only available with several hours advance notice. One example of such an airport is Gerald R. Ford International Airport in Grand Rapids, Michigan. A few, such as Gary/Chicago International Airport in Gary, Indiana, are in fact not international airports at all; they are not designated as airports of entry but aspire to become such in the future and added "international airport" to their names as a marketing tool. Taipei Songshan Airport in Taipei, Taiwan (which retains its name as "Taipei International Airport" in Chinese), relieved by Taoyuan International Airport. Shanghai Hongqiao International Airport in Shanghai, People's Republic of China, relieved by Pudong International Airport.